An ex-Tory and UKIP MP has been given a suspended six-month prison term after being convicted of election fraud. Bob Spink, 69, former MP for Castle Point, Essex, committed the offences during the Castle Point borough council elections in May last year. He was found guilty in December of four counts of permitting a false signature to be included on a nomination form for a UKIP councillor. The judge in the case said the offences undermined "democratic structures". Spink's prison sentence will be suspended for two years. He was also ordered to carry out 150 hours unpaid work. 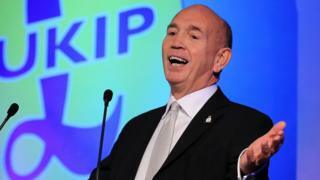 UKIP's election agent at the time, James Parkin, 39, of Canvey Island, who was also convicted of two counts of the same charge and had admitted two, received the same sentence at Basildon Crown Court on Friday. Both men were ordered to pay £5,000 each towards the cost of the case. During the trial last year, jurors heard how Spink tricked "elderly and infirm" voters into signing the forms in April 2016, without making it clear what the documents were or which party he represented. The court heard people in Spink's constituency signed the forms believing they were petitions and had no idea they were supporting the UKIP candidate in the local council elections. Spink had claimed everything was above board and that residents knew what they were signing. None of the candidates included in Spink's deception won a seat on the council - although a handful finished runner-up, the court heard. Sentencing the pair Judge Ian Graham said: "This sort of offending undermines the working of democratic structures in this country. "The democratic process depends on the good faith of those who engage in it, because a lot of what happens is of course quite difficult to police." Spink, from Benfleet, Essex, was Conservative MP for Castle Point from 1992 to 1997, and again from 2001. In 2008, he defected from the Conservative Party and joined UKIP, effectively becoming its first MP.